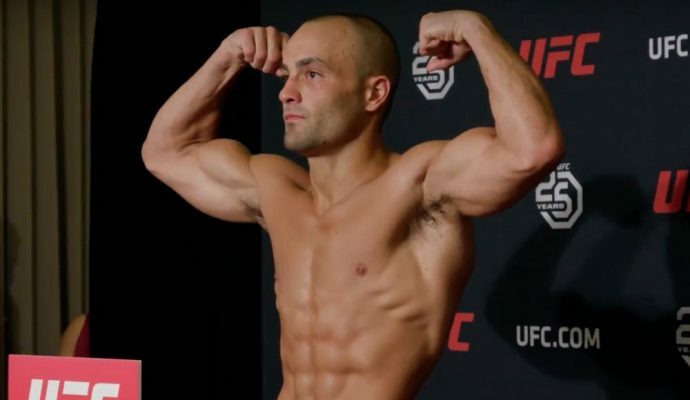 One of the most highly anticipated fights of 2018 is now official as both Eddie Alvarez and Dustin Poirier made weight ahead of their showdown on Saturday night in Calgary. Alvarez and Poirier met once previously in May 2017 but the back and forth battle ended in controversy during the second round, which eventually led to the bout being declared a no contest. Now the two fighters will square off again with the winner undoubtedly moving close to title contention. Alvarez was on championship weight at 155 pounds while Poirier came in at 156 pounds for their five round rematch at UFC on FOX 30. Meanwhile, former featherweight champion Jose Aldo steps into his first non-title fight since 2009 when he was still competing in the WEC. Aldo hit the scale at 146 pounds while his opponent Jeremy Stephens came in at 144 pounds for their featherweight co-main event. Also on the card, former women’s strawweight champion Joanna Jedrzejczyk gets back in action as she takes on Tecia Torres in a pivotal showdown at 115 pounds. Jedrzejczyk, who is also stepping into a non-title fight for the first time since 2014, came in at 115 pounds for the matchup with Torres, who was at the exact same weight ahead of their fight on Saturday night.